This is a 3-a-side RenGo. Migeru : pass for handicap. BenH : Not so sure about all these 4-4 points on a 13x13 board. PPAdams : You can't get away from the fact that there are 4 of them and someone's gotta have them. We've got our 2. About time you caught up. Migeru : Better to exploit Peter's bad move than to fix BenS's. PPAdams: Yes, I did wonder about that. PPAdams : Hmmm, so much to do. Migeru This is great, now BenS should be able to play a sente move. 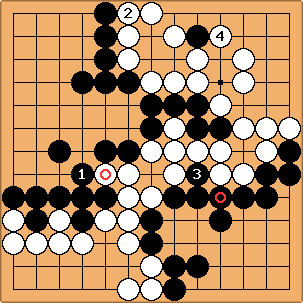 BenS : Not sure what I should be trying to plan for at this stage in a game... First time on a board over 9x9.. but I like this top corner..
Migeru Have no plan in the opening. NathanP : If it's good for them it's bad for us so I better block it. BenH : I think the bottom left is safe now, and the forcing moves don't seem to improve our position that much, so I think it's time to join Ben in the top right. PPAdams : Ok, let's play at the top then. Migeru: Indeed, where you lead we follow. NathanP : or is that benign? I'm no good at invading so I'll leave that to my more esteemed colleagues. Migeru : There is nothing urgent. PPAdams: I don't think I like touching the white stone. It always seems that you've reduced your free sides by 1 before you even start. Maybe I'm wrong to think this. Migeru: I think you're right. As a rule, you attack from a distance and defend in contact. Contact plays will tend to strengthen the opponent's structure. What this disagreement means is that Matt thinks he's defending, and you think you should be attacking. More about this after the dust settles. BenH : I previously thought this exchange was pointless -- now it seems useful. PPAdams : Don't really like this. Seems a bit boring. Migeru: Neither do I, as a matter of fact. Migeru : I think we win the semeais and ladders here. Migeru: and good shape, too. BenH : Boring, but I think it works out reasonably. Migeru: About time we fixed the bad aji of and . PPAdams : I think we unfortunately need to do something here. 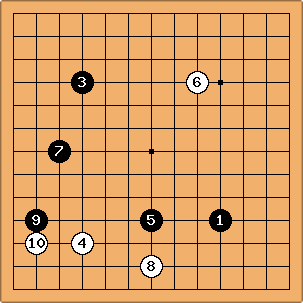 Migeru: If you're going to peep at the cutting point and extend you might as well have played at . 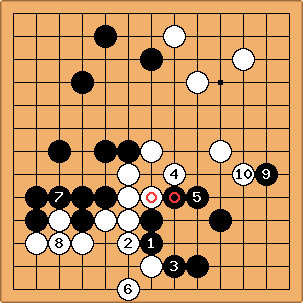 Migeru: That's a great move. Natural and strong. Migeru : Not much choice, really. BenH : A bit painful to ignore the bottom, but I think this is more important. PPAdams : How annoying, didn't want to have to play here. 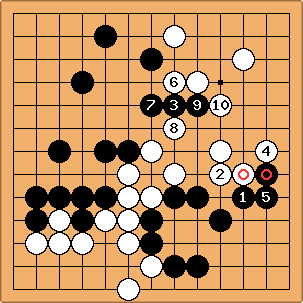 Migeru: Of course, you wanted to play at , which would have been a big sente move. Migeru: I like it that Nathan is playing mostly natural moves. In this case, the price of not replying is a 10-point swing. Migeru : Urgent before big. Sigh. BenH : Might as well put a bit of pressure on the black stone. Migeru : As a matter of fact you have, but (overdramatizing a bit) takes away our last chance to make up our disadvantage. I think we're over 20 points down, not even counting komi. Migeru: Ben, if came immediately after , would you say "ouch"? NathanP : Perhaps i should consolidate - but it looks like we might steal something. Migeru : Our position has collapsed, but I don't think we're losing so badly that we need to resign. We will lose by at least 9 points. 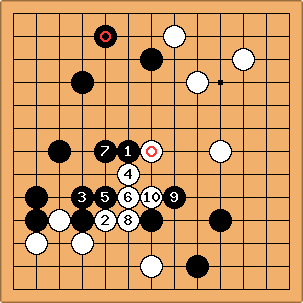 Migeru: As BenH said, this is not double sente because Black has 2 stones on the 2nd line, so white's play would be gote. BenH : That move is sente, but not double sente, I think. It still doesn't hurt to play it, but it's less urgent. PPadams : OK, let's finish this little edge off. BenH: I might have been tempted to play this one further to the left, to reduce the damage from . What do you think, Miguel? MattHope : What the hell - Charge! BenH : Blah blah blah. PPAdams : Let's see where this takes us. 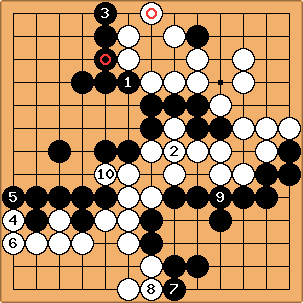 Migeru: Geez, Ban, you just gave up at least 10 points! PPadams: I was wondering if there would be something over here at the end of the game but defending was the more pressing matter to attend to. 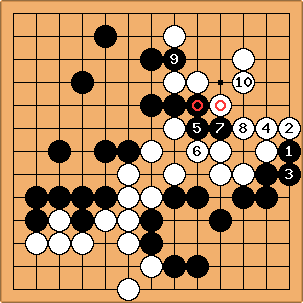 Migeru: I cannot fault BenS for not reading Black's cut just below correctly (or at all). NathanP : Perhaps I can jump further - but this seems deadly enough. Migeru : I think Nathan gave us a couple of points back. BenH : Let's trade invasions. Migeru: Go Ben! This is called mutual damage. I wish you had applied the same principle at move . PPAdams : Ok, I'm pretty sure this isn't the best move but I'm worried about what will happen if I go the other way. Migeru: I think we're back to losing by less than 10 points. PPAdams: I thought we could keep them alive (just). I could be wrong though. Required a black play 2 left of I think in a few moves time. 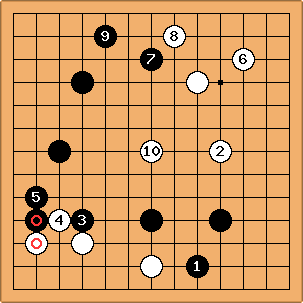 Migeru: I thought white could kill with a white stone to the right of . PPAdams: BenH has shown me that I'd missed how the weak black group in the centre complicates things. BenH : I thought it was complicated if W tried to save the stones. But I'll take them anyway. Migeru: I restored the captured stones, it is hard to read the sequence otherwise. Migeru: would have been better at , but I think the mistake was not playing at . BenS : Hmmm.. Feel I should be attacking but can not see where. So I'll think small and protect the one white stone that's almost surrounded. NathanP : Safety first - ensure the win. Migeru : you took care of our only sente move, pretty much. Migeru should definitely have been at . NathanP : I think that removes our last chance for a mistake. BenS : At what point do we admit defeat? 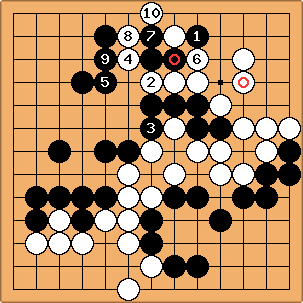 Migeru: If you have nothing better to do than play in your own territory, you pass. After both players pass consecutively, the game is over. Migeru: See this appendix to the Tromp-Taylor rules for a scheme where two consecutive passes initiate the scoring phase, but four consecutive passes end the game. Migeru : Pass. Black wins by 19.